1. Go to More > Settings > Photos & videos. 2. Turn the Auto-play GIFs setting OFF. 1. Tap "V" at the top right of the chat screen > Albums. 2. At the bottom right of an album, tap the options icon > Add photos. 3. Select the photos you want to add, then tap Next > Add. 1. Tap and hold a photo, then tap Save to album > Save. 2. Choose the album you want to save the photo in, then tap Add. • You deleted your chat history. • You uninstalled then reinstalled the LINE app (including restoring the app from backup). • Your device has changed (e.g. you changed devices; you repaired your device). Please make sure to back up any important chats in the future. For information about backing up and restoring your chat history, please see this Help article. If you are having problems sending or receiving messages, please try the following steps. 1. Update your LINE app from the URL below. 3. Go back to the list of chats, then open the chat you are having problems with again. Please note that sometimes it may take a while for a chat message to show up after you receive the notification. If the app crashes when you are in a chat, there may not be enough memory on your device. Please try the troubleshooting tips listed below. • Close all running apps. • Restart the LINE app. • Ensure that you have more than 2 GB of free space on your device. We have added a new feature from LINE ver. 5.2.0 that automatically creates a chat room with recently added friends. The first time you open the newly created chat room, you will be asked to send your friend a sticker. This message may also appear at the top of the chat list when you or your friend switch “Allow Others to Add” ON. If this message appears from a friend you have not chatted with recently, it is possible your friend has switched “Allow Others to Add” ON. Please be assured that your account has not been stolen if you see this message. If you do not want to send a sticker to say hello, simply tap the x button on the top right of the screen. To edit or delete a post, please follow the steps below. 1. Tap the Note you want to edit or delete. 2. Tap the options icon at the top right of the post. 3. Select either Edit or Delete. Note: You can only edit or delete your own posts. 1. At the top right of the chat screen, tap "V" > Albums. 2. Tap "..." at the bottom right of the album you want to delete, or select the album and tap the options icon at the top right of the screen. 3. Tap Delete album > Delete. 2. Tap the album > the options icon at the top right of the screen > Select. 3. Select the photos you want to delete, then tap the trash can icon at the bottom left of the screen > Delete. Note: If you want to select all of the photos, tap Select all. Please remember that once an album or photo is deleted, it cannot be restored. It may take some times to send, receive, and display images, videos, and audio messages. Images are only stored on our servers for a certain period of time, after which they can no longer be received. We are unable to provide details about how long images are stored. By tapping the thumbnail received in a chat, you can save the image in your LINE app. To save it in the default gallery app on your device, please tap Save after opening the image. Images saved in the LINE app will become unavailable if you delete the app's cache using a cache clearing app. For problems with images, videos, and audio messages, please try the following. 1. Close all running apps. 3. Update your LINE app from the URL below. 5. Delete any unneeded apps and data on your device. If you're having issues with creating, inviting friends to, or leaving a group chat, please search this Help article. If your issue is with a group's notes or albums, please see this Help article. • Go back to your chat list and reopen the chat room you're having issues with. 1. Tap "+" next to the message input box, then tap Location. 2. Select your location and tap Share location. If you can't find the location you want to send, you can search for its name or address in the search field on the location selection screen. 1. Tap the chat room with the photo or video you want to share. 2. Tap the share icon next to the photo or video. 3. Select the friends you want to share with, then tap Send. 2. Tap the photo or video. 3. Tap the share icon at the bottom left of the photo or video. 4. Tap the destination you want to share with. 1. Tap the photo icon next to the text box. 2. Tap the photo you want to edit. 3. Edit the photo any way you like and tap the paper airplane icon to send it. You can use the following tools on the photo editing screen. Choose from a variety of filters to alter the mood of your photos. Trim your photos to focus more on a certain area. Draw with pens of various colors and thicknesses. Add text to photos in the color of your choice. Add emoji, the current date and time, a geotag, or other stickers to your photos. By tapping Undo (the round arrow) at the top of the screen, you can discard all of the edits you've made. 1. At the top of a chat room screen, tap the call icon > Video call or Live. 2. Tap the square icon at the top of the screen. You can move the shrunken screen wherever you like! Note: Tap the arrow to enlarge the screen. 1. Tap and hold the message you want to reply to. Note: Reply will only appear for text, stickers, emoji, photos, or videos. 3. 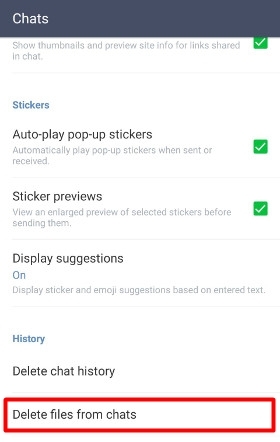 Enter a message with text/emoji or choose a sticker to send. In addition to text messages, you can send things like photos, videos, voice messages, your location, and even money (via LINE Pay) in LINE chat rooms. Note: Up to 50 photos/videos can be sent at once. 1. Tap the Chats tab > the name of the chat room you want to send content in. 2. Tap the photo icon next to the text box. 3. Choose the photos/videos you want to send, then tap Send. - Tap the icon at the bottom right of the screen to browse all of your photos/videos. - The number of photos/videos you've selected appears at the bottom of the screen. Tapping this number lets you confirm and reorder them. 2. Tap the name of the friend or group you want to send something to. 3. Tap "+" next to the text box. 4. Tap and send the content of your choice. With LINE, you can take photos and videos (using filters and effects, if you like) in chat rooms or on Timeline. There are also lots of other convenient features for editing your content. 2. Tap the camera icon next to the text box. 3. Tap the round shutter button at the bottom center of the screen. Note: You can switch between taking photos, videos, and GIFs by tapping or swiping on your camera screen. 4. Edit the content any way you like and tap the paper airplane icon. You can use the following tools on the camera screen. Turn your camera's flash ON or OFF. Set a photo timer for 3 or 10 seconds after you tap the shutter button. Change the aspect ratio of your photo to 1:1, 3:4, or 9:16. Use animated effects to match your expression. Choose from a variety of filters and shades to alter the mood of your photo or video. Switch between your rear-facing camera (for selfies) and forward-facing camera (for shots of the scene in front of you). Please follow the steps below to mark all unread messages in a chat room as read. 2. Tap and hold the chat in which you want to mark all unread messages as read. 3. Tap Mark as read. 2. Tap the options icon at the top right > Mark all as read. The voice message feature lets you record and send audio to friends. You can send voice messages with the following steps. 2. Tap the name of the friend or group. 3. Tap and hold the microphone icon on the right side of the message input box. 4. Record your message while holding the microphone icon. 5. When you have finished recording, remove your finger from the microphone icon to send your message. Note: If asked, please allow voice recording or microphone access permission, or turn your microphone ON from your settings. You can use multiple photos and a variety of effects to make slideshows or GIF animations and send them in chats. • Trim photos or add music, filters, and other effects when making slideshows. • Change the size and playback speed for GIFs. 1. Tap the photo icon next to the text box, then tap the photo list icon at the bottom right of the screen. 2. Select two or more photos. Note: The photos you select will appear at the bottom of the screen in the order they were selected. You can reorder them by tapping and holding them, then dragging them to the order of your choice. 3. Tap the slideshow or GIF icon. 4. Edit the content any way you like, then tap the paper airplane icon to send it. With LINE version 9.1.0 the way to back up and restore chats has been streamlined. If you are using LINE version 9.1.0 or later, please see this Help article about how to back up and restore your history. If you are using a version of line earlier than 9.1.0, you can back up your chat history on your device or SD card by following the steps below. 2. Tap the chat you want to back up. 3. Tap "V" at the top right of the chat. 4. Tap Chat settings > Back up chat history. - Selecting Back up text will not save stickers, photos, videos, and voice messages. - If you select Back up all data, it will save the chat history as well as stickers and other data for that chat. 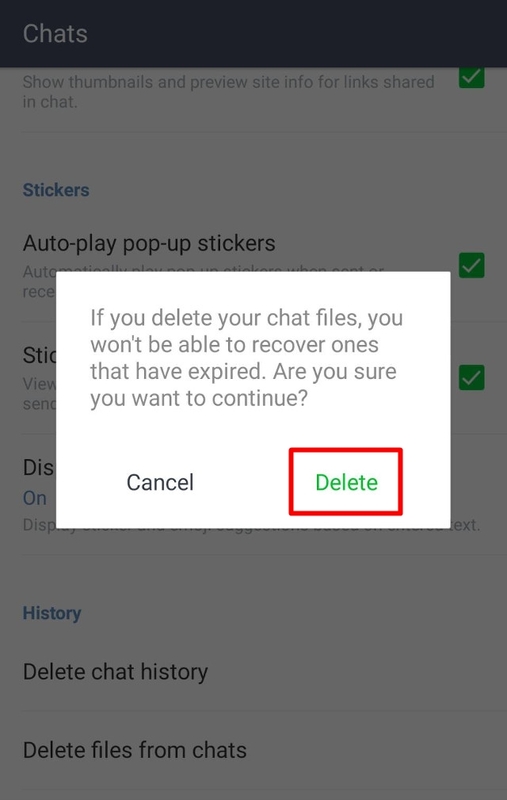 - If you want to restore the chat history for multiple chats after changing devices, you need to select Back up all data for each chat beforehand. If you are viewing this page on your smartphone, tap this link to go to your chat list. After selecting Log in as existing user and successfully transferring your account, you will be able to restore the chats that were saved by selecting Back up all data. For steps on how to restore your chat history, please see this Help article. If your chat history was saved on your device, you will need to copy the backup file to an external device like an SD card. For more information regarding issues with importing your chat history, please see this Help article. If you are using a version of LINE earlier than 9.1.0 and want to restore (import) your chat history from a backup, you will need to select Back up all data from the Back up chat history option beforehand. To restore your chat history, follow the instructions below for your situation. Note: Make sure you have enough free space on your SD card/device. 1. Insert the SD card with the backed up files into your device. 2. Open the chat room that you want restore the chats for > tap "V" at the top right of the screen > Chat settings. 3. Tap Import chat history. - If the Import chat history option does not appear, please see "If you are not using an SD card" below. - If you want to restore the chat histories for multiple chat rooms, you need to follow the above steps for each room. Please refer to this Help article. If you're having issues restoring your chat history, it may be due to one of the following reasons. From LINE version 9.1.0, there is no longer a feature to back up and import your chat history from inside a chat. If Import chat history does not appear, you won't be able to import chat history saved on an SD card or LINE Keep. If you saved the backup file to Keep on LINE, you'll need to download it from Keep and save it to your new device after transferring your account. Files created by selecting Back up all data are saved on either an SD card or your device. 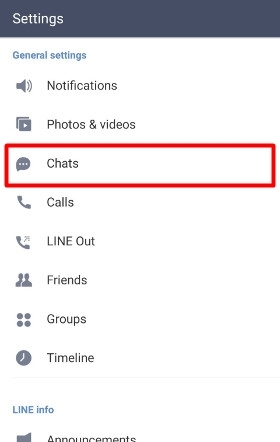 If you're unable to import (restore) your chats, you'll need to manually move the relevant file to the folder titled "LINE_backup" on the device you want to restore your chat history on. Please use a file managing app or connect your device directly to your PC to access the backup files and move them. - If this folder doesn't exist, please create one. - You will not be able to restore your chats if you did not select Back up all data from the Back up chat history option. If you're not sure how to create folders or move files, please contact your device manufacturer. The app may freeze or crash if your device doesn't have enough memory or the specs are too low. Please delete any unnecessary data and restart your device before trying again. If you're using LINE version 7.5.0 or later, you can back up and restore your chat history using Google Drive by following the steps below. - Before backing up your chat history, make sure you have enough free space on your device and Google Drive. - Be sure to try the following steps in an area with a strong network connection. 1. From the Friends or More tab, tap Settings > Chats. 2. Tap Back up and restore chat history. 3. Tap Back up to Google Drive. Note: Images and stickers are not backed up with your chat history, so we recommend saving any important images in Albums or Keep. Note: With LINE version 9.2.0 and later, you can also restore your chat history when you transfer your account. If you don’t back up your chat history beforehand, it will be deleted when you transfer your account after changing devices. As chats are stored on your device, you’ll need to back them up before changing to a different one. Important: You can only transfer your chats between devices running the same OS. You can use iCloud to back up your chats. For more details on how to back up and restore your chats, please see this Help article. You can use Google Drive to back up your chats. For more details on how to back up and restore your chats, please see this Help article. No, you cannot transfer your chat history between devices running different OSes (e.g. Android to iOS or vice versa). 1. Tap "V" at the top right > Search. 2. Enter what you want to search for in the Messages field. 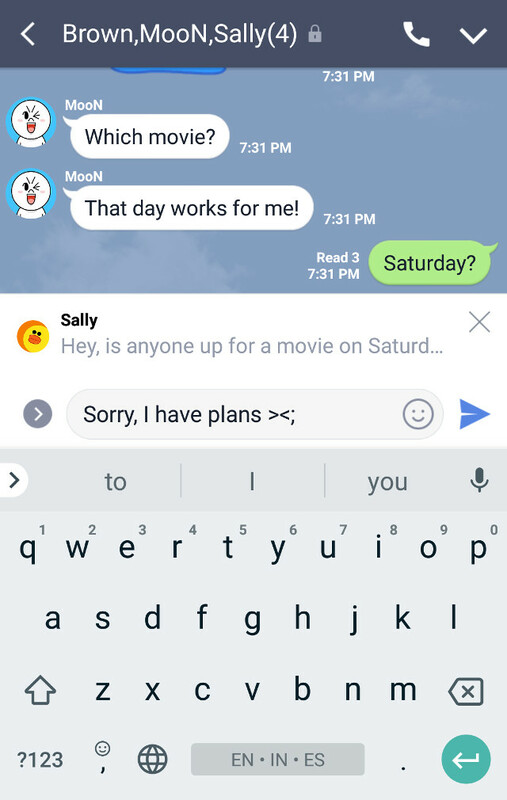 You can also search through messages for a specific date by tapping the calendar icon at the top right of the keyboard. If you want to search through the messages in all of your chat rooms, please see this Help article. 2. Tap Delete chat history > Delete. 1. From the Chats tab, select a chat room > tap “V” at the top > Chat settings. 2. Tap Delete chat history > OK. Important: Deleted messages cannot be restored. You can save the messages in a chat as a text file by following the steps below. Note: You cannot restore your chat history on LINE from a text file backup. 1. Select the chat room you want to back up. 2. Tap "V" at the top right of the screen > Settings or Chat settings. 3. Tap Export chat history and choose how you want to send the file. 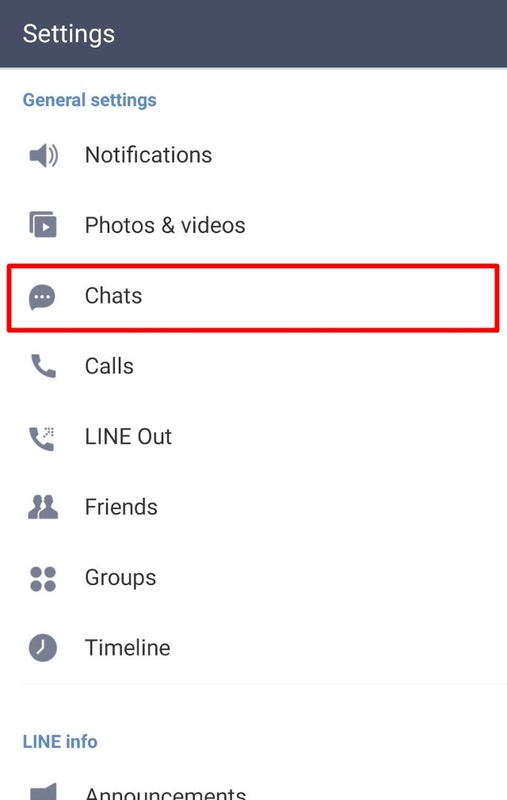 For information on how to restore your chat history after transferring your account or reinstalling LINE, see this Help article. 1. Tap the search icon (magnifying glass) at the top right of the Chats screen. 2. Type what you're looking for in the search box. Letter Sealing will be turned ON for the initial setup. 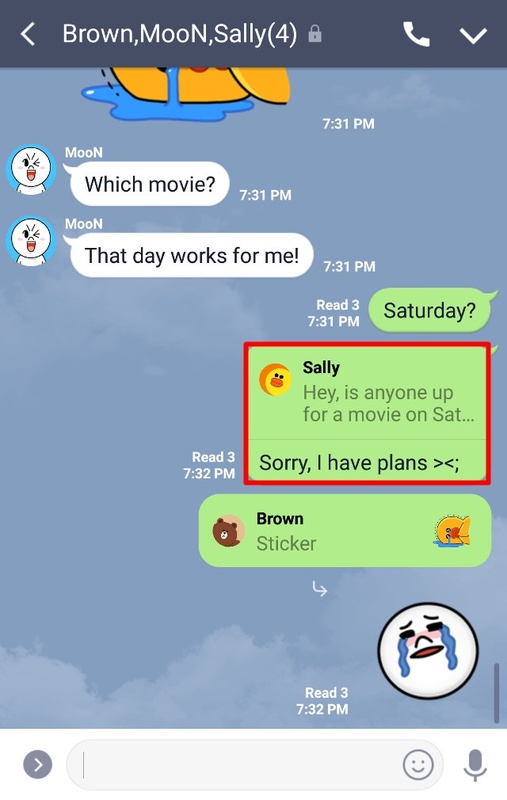 If you are using the iOS version of LINE and Letter Sealing is turned ON, you will not be able to preview messages. We recommend keeping Letter Sealing turned ON at all times in order to protect your messages. If however, you would like to change the settings, please refer to the following steps. Please be sure to follow the steps on the smartphone version of LINE. If you are accessing this Help article from your smartphone, tap here to move to the settings screen. 1. Tap More > Settings > Privacy. 2. Turn OFF Letter Sealing. To check whether a chat is protected with Letter Sealing, tap your friend's name or the group name at the top of the chat room. If Letter Sealing is turned ON, you'll see "This chat is protected with Letter Sealing." Note: You'll also see a lock icon at the beginning of the sentence. If "This chat is protected with Letter Sealing." doesn't appear, it means Letter Sealing is turned OFF. Please see this Help article for the steps to turn Letter Sealing ON. There are several differences between group chats and multi-person chats. Group chats let you set a group name and profile photo, as well as use convenient features like Albums and Notes. However, the friends you invite need to tap the Join button to participate in the group. 1. Tap the Friends tab on the main menu. 2. Select the group name and tap Chat. Note: If you want to create a group, please see here. Several friends can start chatting as soon as they're invited to a multi-person chat. Compared to groups, the features you can use are limited, but multi-person chats offer the advantage of letting you easily create chat rooms with several friends. 1. Tap the Chats tab on the main menu. 2. Tap the speech bubble icon at the top of the screen. 3. Select who you want to add and tap Chat. 1. At the top right of the Friends tab, tap Add friends (the silhouette icon) > Create group. 2. Enter a name for the group, then select the friends you want to add as members. -The friends you invite won't become group members until they select Join in their invitation. - If you're using LINE version 8.13.0 or later, your group name can be up to 50 characters long. - You can update to the latest version of LINE here. 1. Go to the Friends tab and tap the name of the group. 2. Tap ">" next to the member icons. 3. Tap the options icon at the top right of the screen > Edit > Delete next to the name of the members you want to delete. To delete a group, follow the steps above to delete everyone but yourself. After you've removed everyone else, select Leave group to delete it. 1. From the Friends tab, tap the group you want to invite friends to. 3. Tap the options icon at the top right of the screen > Invite. 4. Select the friends you want to invite, then tap Invite. Your chat messages, notes, albums, and photos will not be deleted if you leave a group. If there is any data you want to delete, please do so before leaving the group. When a group member deletes their account or leaves the group, a message saying "(friend's display name) left the group." will appear. 1. Tap the name of the group you want to leave from the Friends tab. 4. Tap Leave > OK. If every member leaves the group, all the posts in it will be deleted and cannot be restored. Multi-person chats are group-like chat rooms created by inviting friends to a 1-on-1 chat. With normal groups, a user that was invited cannot participate in the group unless they select Join. However, with multi-person chat rooms, you can immediately start chatting with friends who were invited. Multi-person chats easily allow you to communicate with a number of friends; however, features found in 1-on-1 and group chats (such as Notes and Albums) cannot be used. If you'd like to share things like information and photos with friends in a multi-person chat room, we suggest making a group out of that multi-person chat. We are sorry to say that you cannot change the title of a multi-person chat. If you create a group out of a multi-person chat room, you can set any title you’d like as long as it’s within 20 characters. 2. Open the relevant multi-person chat room. 3. Tap the V icon > Create group. 4. Set a name for the group, then tap Save. Please note that messages exchanged in the multi-person chat will not be transferred to the group. To view those past messages, please check the multi-person chat room. Once an album is deleted, it can’t be restored. Your friends in the same chat room will also be unable to view the deleted album. You can share photos saved in albums with friends/groups, on Timeline, or with other apps. Note: You can share up to 20 photos at a time. 2. Select the album, and tap the option icon at the top right of the screen > Select. 3. Select the photos you want to share, then tap the share icon at the bottom of the screen. 4. Select how you want to share your photos. 2. Tap "+" at the bottom right of the screen. 3. Select the photos you want to save, and tap Next. 4. Enter an album name and tap Create. - You can enter up to 50 characters for an album name. - If you don't enter an album name, the name will be the date the album was created by default. - The same album name can't be used more than once in the same chat. 2. Tap "..." at the bottom right of the album you want to rename, or tap the album > the options icon at the top right of the screen. 4. Enter an album name and tap Rename. You can save specific photos in an album or save the whole album. 2. Tap "..." at the bottom right of the album you want to save, or tap the album > the options icon at the top right of the screen. 2. Tap the album > the option icon at the top right of the screen > Select. 3. Select the photos you want to save, and tap the download icon at the bottom right of the screen. Up to 100 albums can be created per chat. Additionally, a maximum of 1,000 photos can be added to each album (up to 300 photos at once). Note: You can select up to 20 photos at a time when saving photos in a chat to an album by tapping and holding them. 1. Open the 1-on-1 or group chat you want to create a note in. 2. At the top right of the chat screen, tap the document icon. 3. At the bottom right of the screen, tap the pencil icon > Write. 4. Enter the content you want to share, then tap Post at the top right. You can also attach stickers, photos, videos, web links, and locations to your notes. - Up to 20 stickers, photos, or videos can be attached to a note. - Only one web link or location can be attached to a note. - Sound/animated stickers can't be attached along with ordinary stickers. - Only one sound/animated sticker can be attached to a note. Notifications for Notes are sent to you as push notifications and can also be checked from the bell menu on Timeline. 2. At the top right of the chat screen, tap "V" > Settings. 3. Turn Note notifications OFF. Notes will only appear on Timeline for the groups or friends you choose to share them with. Please rest assured that other users will not be able to see your notes on Timeline. When a user joins a group, they can view Note and Album posts that were made during the time their membership was pending, but will not be able to see any chat messages posted before they joined. 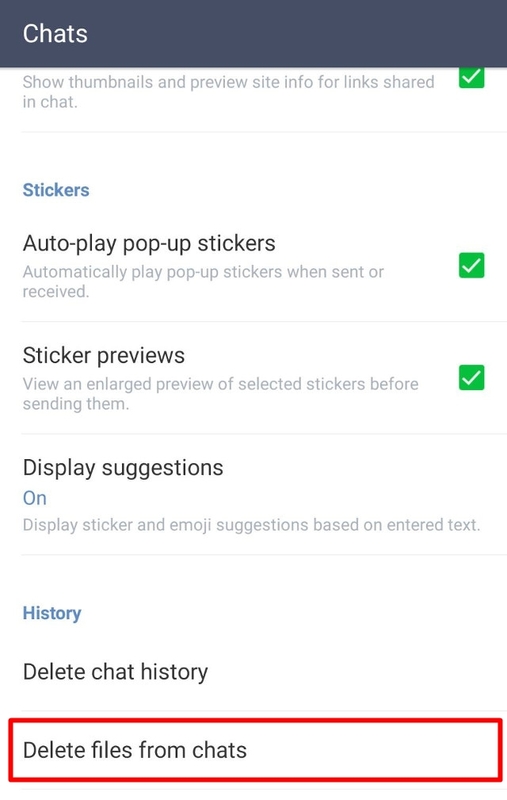 The suggest feature lets you quickly choose emoji and stickers that match the text you enter. Note: Some paid stickers and emoji are not compatible with this feature. 3. Turn the setting for Display suggestions ON or OFF. You can move to the Display suggestions screen by tapping here on your smartphone. You can delete chat room messages from appearing on your device anytime. Important: Deleting a message will not remove it from another user's device, and they will still be able to see it in the chat room. 1. Tap and hold the message you want to delete. 3. Tap Delete at the bottom of the screen, and then confirm by tapping Delete once again. If you don't want others to see a message you sent, you can unsend a message within 24 hours of sending it. For more details, see this Help article. No one will be notified if you delete a message or chat room. However, if a message is unsent, everyone will be able to see a notice saying “~ unsent a message” in the chat room. You can remove a message within 24 hours of sending it. To do so, just tap and hold the message, then select Unsend. Even if the message was read, this will remove it from the devices of everyone in the chat room. - Everyone will still be able to see a notice that shows you removed a message. With the proper version of LINE you can unsend text messages, stickers, photos, videos, voice messages, song posts shared from LINE MUSIC, URLs, contact information, location information, files, and call histories. 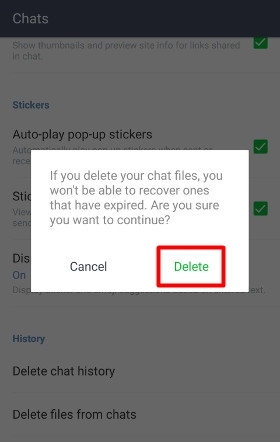 To delete chats, follow the steps below. Note: Chats cannot be restored after you delete them. 1. Tap the Chats tab > the menu icon at the top right > Edit messages. 2. Choose the chat you want to delete. 3. Tap Delete > Delete. To archive a chat, please follow the steps below. 2. Tap the three dots at the top right, or Edit at the top left. 3. Select the chats you want to archive on the Edit Chat List, then tap Archive at the bottom right. To view an archived chat again, please follow the steps below. 1. Select the friend or group from the Friends tab. 2. Tap Chat on the pop-up. If you cannot find the friend on your friends list because you have not added them, have deleted them, or they have deleted their account, you will not be able to view the chat again. Ask one of your friends to send a message in the chat. Keep is a personal storage service that makes it easy for you to save content and share it with your friends. It lets you upload chat room messages (text), photos, videos, and voice messages directly to LINE's servers. To see your files saved in Keep, tap your name on your friend list > Keep. - You can store up to 1GB of data. - Files over 50MB will only be saved for 30 days. Keep has a storage capacity of 1GB with no limit on the storage period. However, individual files over 50MB are limited to a 30 day storage period. On the list screen, these files will appear with a D-29 mark and the number will countdown daily. Keep has a total storage limit of 1GB. If you have reached the 1GB limit, you will not be able to save any more files. Please try freeing up some space before adding more files. You cannot save photos over a certain size and resolution. You may not be able to upload to Keep if you don't have enough storage space on your device. Please free up space on your device. Saved files will appear once all uploads are completed. If your saved file does not appear, it is possible the file has not completed uploading to the server. Please give it some time before checking again. The file viewer feature is not available for iOS version 7.0.x. Please check which OS version your device is running. Adding tags to saved files makes classifying and searching for them more convenient. Up to 10 tags can be added to one file. 1. Tap the file you want to tag. 2. Tap the menu icon at the top-right corner > tap Add Tags. 3. Enter a tag name > tap SAVE. 1. Tap the menu icon at the top-right corner > tap Add Tags. 2. Select the files you wish to tag > tap Add Tags. 1. Tap the file you want to share. 2. Tap the share icon at the lower-right corner > Copy Link. 3. Send the copied link. Please be aware that anyone you share a link with will be able to view the file's content. 1. Tap the relevant file. 2. Tap the share icon at the lower-right corner > Delete Link > Delete. After deleting a link, no one will be able to view the file, even if they try to access the link you previously created. - The original file has been deleted. If the content of the file has been reported as a spam or malware, it is possible access to the file has been restricted. Yes, you can share files such as photos and videos saved in Keep to other apps. 1. Go to the Friends tab > tap your profile > Keep. 2. Choose a file and tap the share icon at the bottom right of the screen. 3. Tap Share in other app > select the app to share with. 2. Select either All, Photos, Text, or Files to find what you want to delete. 3. Tap the options icon at the top right of the screen > Delete. 4. Select what you want to delete, then tap Delete. 3. Tap what you want to delete. 4. Tap the trash can icon on the lower left of the screen > tap OK or Delete. 1. On the Friends tab, tap your profile > Keep. • For Enter text, enter text directly and tap Save. • For Photo/Video, choose the photo or video you want to upload from the camera roll and tap Done. • For Take photo or Take video, take the photo or video and then tap Use Photo or Use Video. • For Select file, choose a file to upload from the files saved on your Android device. You can report a user for sending spam messages from the chat room they are sent in. Note: If you report someone, they won't be notified that you did so. 1. From the chat screen, tap the V icon on the upper right of the screen. 4. 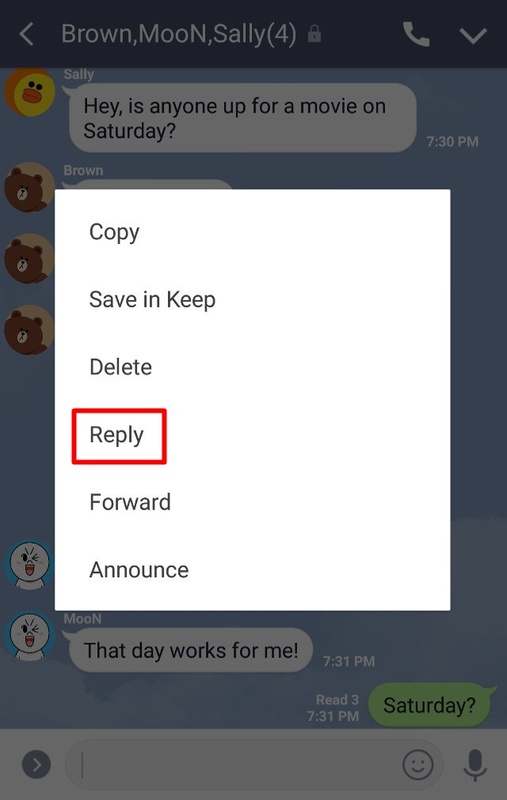 Select your reason for reporting the chat, then tap Agree & send. We will investigate the matter based on your report. If we find that the user is in violation of our Terms and Conditions, we will take the appropriate actions. Please understand that we cannot provide you with the details regarding the results of our investigation or actions taken as it pertains to the privacy of our users. For the steps to report a post on Timeline, see here. If the LINE app is performing slowly or frequently stops working, it may be that there is a buildup of cached (temporary) files. 1. Tap More > Settings > Chats. 2. Tap Delete files from chats > Delete. 2. Turn ON the URL previews setting. Previews will appear for links shared in chats after this setting is turned on. Please follow the steps below to "announce" (permanently display) messages, polls, or events you've sent/received/created at the top of a chat. 1. Tap and hold the message you want to announce. 1. Tap "+" at the bottom of the chat screen. 2. Tap Poll and then the poll you want to announce. 3. Tap Announce > OK. 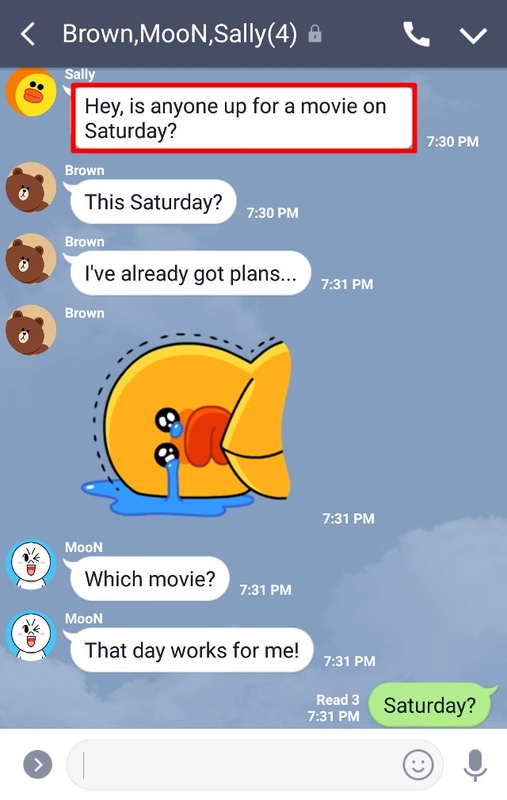 Note: The Poll feature is available in group chats and multi-person chats. 1. Tap "V" at the top of the chat screen. 2. Tap Events and then the event you want to announce. 3. Tap Set as announcement > OK.
1. From the Chats tab, select a chat room > tap “V” at the top. 2. Tap Chat settings > Chat wallpaper. 3. Choose one of the options to set a wallpaper. If you are having problems with free voice calls, the following may be to blame. 1. Your friend is not a LINE user. 2. You may be using an older version of LINE. 3. One of you may be blocking the other. 4. You have "Receive Voice Calls" turned off. 5. You are not mutual friends. Voice calls cannot be made if only one of you has the other as a friend. If you are still having problems after checking the above, please try the following steps. • The friend you're calling isn't a LINE user. • You're using an older version of LINE. • You've blocked the friend you're calling, or they've blocked you. • LINE's settings for Allow voice calls are turned OFF. • You haven't added the person you're calling as a friend, or they haven't added you. Note: Video calls cannot be made if only one of you has added the other as a friend. • Your device doesn't meet the recommended system requirements. 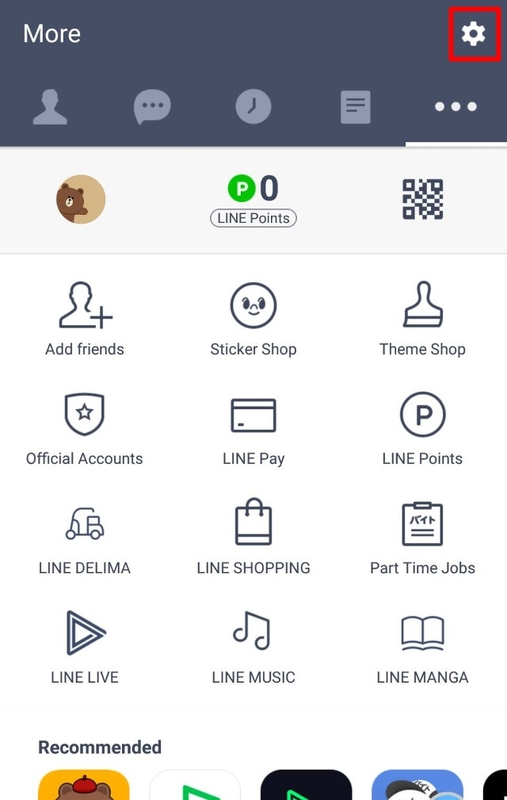 • Update to the latest version of the LINE app here. LINE voice and video calls are made over an internet connection, so please be sure that your connection is stable. • You're updating apps, or uploading/downloading files. • The signal is weak. • Some router settings are affecting your connection. • Update the app to the latest version here. • Turn your speakers off and on, and adjust the volume. • Turn LINE's Allow voice calls setting ON. For more details, please see here. Notifications for incoming and outgoing voice and video calls may not appear correctly depending on the strength of your device's signal. Please be sure to use a stable network connection. Full HD voice is LINE's high sound quality call service that utilizes full-band bandwidth. If you're in a Full HD voice-compatible environment when you make a free call, this feature will automatically turn ON, and "Full HD voice" will appear in green at the center of the call screen. Note: Full HD voice cannot be switched ON or OFF manually. You can use Full HD voice if your device meets the system requirements below. Note: If your device doesn't meet these requirements, the Full HD voice feature logo will not appear on the call screen. Devices running both Android OS 8.0 or later along with LINE version 8.15.0 or later (cannot be used on some devices). Devices running LINE version 8.15.0 or later. Users who are friends on LINE can enjoy making free voice and video calls. 1. Tap the friend you want to call in the friend list. 2. Tap Free call or Video call. There are several ways to make calls from a chat that includes the friend you want to call. Please use one of the methods below. • At the top right of the chat, tap the phone icon > Free call or Video call. • Tap your friend's profile photo > Free call or Video call. If you're using a 3G or 4G network, packet communication charges may apply during a call. We recommend using a flat-rate data plan. If the call quality is low, please try using a Wi-Fi connection. Please see this Help article for information about the recommended system specifications for free voice and video calls offered by LINE. Note: These calls are not supported by devices with Intel Atom processors. Since you may be charged for the data used during calls if you're using a 3G or 4G network, we recommend using a flat-rate data plan. If the call quality is low, please try using a Wi-Fi connection. Note: You may not be able to use effects and filters on some devices. The above mentioned devices must also be running LINE versions 6.8.0 or later. Even if you fulfill the above stated conditions, you may not be able to use effects and filters depending on the performance of your device. In these cases, the smiley face icon for the actual feature will not appear. 2. Tap Calls > check the status that appears under Video call effects and filters. LINE's basic features, including voice calls, video calls, and chats (sending of text, images, and locations, and the use of bots such as the translation or weather bots) are free to use. Some stickers and Coins are available at a fee. Calling or chatting with users on different mobile service carriers is also free. LINE will not charge you even if you are calling a friend in a different country or using the service while you are traveling. However, like all other apps, you will be charged by your mobile service carrier for the data used. Depending on your price plan, you may be charged each time you connect to LINE, so we recommend using a flat-rate data plan. If you are using a flat-rate plan, you should not be charged extra for using 3G, 4G LTE, or Wi-Fi data, but please check with your mobile service carrier for details. 1. Go to More > Settings > Calls. 2. Turn Allow voice calls OFF. Bluetooth devices can be used with LINE. Please understand, however, that we cannot guarantee such devices will work properly, as they rely on the performance of your smartphone. 2. At the top right of the chat, tap the phone icon > Voice call or Video call. Please follow either of the steps below. - Tap the call icon at the top of the chat screen of the ongoing call > Join > OK.
- When you receive the message that the call is starting tap Join > OK.
You can invite friends who have not joined a call to a group call via a group or multi-person chat. 1. Start or join a group call. 2. Tap the person icon on the top right of the call screen. 3. Select the members you wish to invite and tap Invite. Tap and hold on a friend from the call members listed on the right side of the screen, then drag them to the screen of the friend you want to switch out. Tap the friend you want to switch to from the members listed on the bottom of the screen. The Live feature lets you make and view live videos in group and multi-person chats. Up to 200 people can watch a live video stream. 1. Tap a group chat or multi-person chat. 2. Tap the call icon at the top of the screen > Live. You can also share your smartphone’s screen with other users by tapping the share button at the bottom right of the screen after selecting Live. If you've already started a stream, you can share what's on your screen by making the Live window full screen and tapping “…” > Share screen. Even if you fulfill the conditions above, you may not be able to use effects and filters depending on the performance of your device. In this case, the smiley face icon used for the feature will not appear. 2. Tap Calls > check Video call effects and filters. After you get a notification, it may take some time before you receive the actual message. • Go back to the list of chats and then reopen the chat room you're having issues with. • Check or disable any web limiting or filtering services you may have in place. Note: Consult your mobile phone carrier for more information about web limiting and filtering services. Depending on the strength of your network or Wi-Fi connection, the badge icon may be delayed or not appear at all. Usually, the badge or "N" icon will stay on display until you start the app or check any new information that's been added. For a solution to the issue you're having, please see the Help article below that best applies.